I'm very sorry for the length between the last post and this one. There have been no new leads, as Daniel and I have had no luck in gaining Erin's help. The amount of year-end schoolwork definitely doesn't help either of us. For these reasons, I figured that there was no good in posting, but I want to let you all know that we're still here. In a few weeks, Daniel and I will be going home for the summer, which should make things go a bit more smoothly. Thanks to anyone who's still hanging in there with us. It has been brought to my attention by a commenter in the last post that there are bold letters in both of the messages that Daniel and I received. The letters can be arranged to spell out "HELP ME," but I don't want to place any bets on it yet. It could be a mistake of handwriting or there could be letters that are being missed. Summer break will make research a lot easier; I live close to Daniel (and Erin if she's still living there). We'll also be able to get more information on the whereabouts of Kyle hopefully. 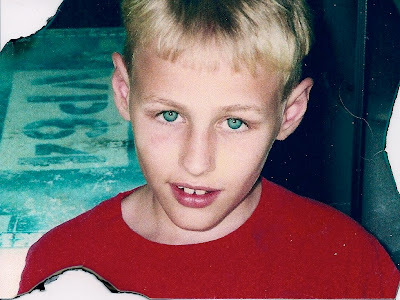 Here are the letter and photo that we think might be from Kyle. I didn't put them in that last post because I've never used a blog and I don't really know how to format anything. June asked me to come onto this blog and start giving my input on what's been happening. After talking to her and reading the posts she's put up I can honestly say we've been experiencing the same things. 2 or 3 weeks ago I got a letter in the mail, no return address and no stamp. At first reading it I was pretty creeped out but I figured it was probably my friends trying to to pull a stupid joke, so I put it my crap drawer at school. I had pretty much forgotten about it until I got a call from June saying she got the same thing in the mail. She told me her Kyle theory. I wasn't sure who June, who I hadn't really talked to for years, was talking about. Mid conversation though, all these memories came flooding back to me. I couldn't believe I had forgotten one of my best friends from middle school. Granted we had stopped hanging out completely by high school. I tried to remember seeing or talking to him in high school but other than a few nods or glances, I can't remember any. Once I read the letter (which I'll include in a separate post), it did strike up memories when I tried to set him up with this girl in middle school. The day after the date he didn't show up to school and the girl was trashing talking about him. Obviously the date went pretty bad. I guess Kyle wanted to prove he sent the letter. Anyways, I think me and June are talking about getting together when we're all home next. She's trying to get Erin to help us out, I think I'll try giving her a call and seeing if I can convince her. Thankfully, my mother was able to find my old yearbooks with no trouble. It was a little difficult coordinating the research over the phone, but she eventually found the two names I was looking for. These people, my old friends, are Daniel Fredrickson and Erin Lassiter. Besides names, I had no other contact information for either of them until I looked on the website of our old high school. I was able to find a list of the colleges to be attended by all of our graduating class, including both of them. Daniel is currently at Western Carolina University, Erin at the University of North Carolina in Greensboro. It’s odd that I didn’t hear anything about them in high school, even if we had grown apart. It’s almost as if they hadn’t attended with me. It took a little research, but I was able to find both cell phone numbers on the contact pages of their respective university websites. I called them both yesterday. Daniel was helpful enough. He seemed genuinely concerned with what’s going on and I think he might lend a hand in trying to solve this. To my surprise, he told me that he also received a letter in the mail along with the same photo that was sent to me. I plan on keeping close contact with him for the time being. I wish I had gotten more information from Erin, but she almost seemed to be in a hurry to end the call. She dismissed my story as silly, claiming to not remember who I am. I can’t blame her for that, as I didn’t remember her either. Still, she seemed a bit dismayed and even slightly angry that I brought the subject up at all. She eventually said she had somewhere to go and wouldn’t answer her phone later that evening. I finally feel like I have a lead, and I only hope that the trail doesn’t go dead. 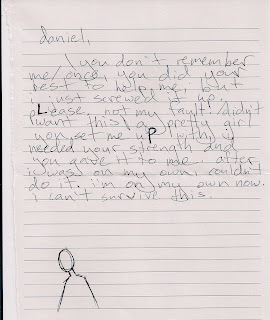 I’ll be calling Daniel soon to find out what was in the letter he received. Something recently occurred to me. I mentioned before that Kyle and I were close friends with two other children, even though I don’t remember their names anymore. Kyle and I have grown apart over the years, to the point of me forgetting his existence until now, but one or both of the others may very well have remained in contact with him. If that’s true, I might be able to solve this mystery swiftly and focus on my schoolwork again. I plan on calling my mother this weekend to see if she can find my old yearbooks. I’m sure I can rediscover my forgotten friends with them. I hope at least one of them can clear this up so I can sleep peacefully again. My apologies for not introducing myself in that last post. Creating this blog was a product of my grasping at straws and I guess I didn’t think it through before beginning it. I know that if any of you out there have the information that I am looking for, you probably won’t want to hand it out to a stranger on the internet. To try and convince you that I am not a psycho, let me tell you a little about myself and anything I already know about the letter that I included in the previous post. My name is June Davis and I am attending Appalachian State University as a sophomore, studying to be a teacher. I am from a small town called Mayodan, the name coming from the joining of two rivers, the Mayo and Dan, in that area. I’m a sucker for that play on words and am guilty of using it frequently, hence the name of this blog. I have recently acquired a twitter account at the request of some nagging friends, and you can also contact me at june0davis@gmail.com. I will stop there as I do not feel comfortable giving even that much information away here, but I’ll risk it to get the answers I am hoping for. 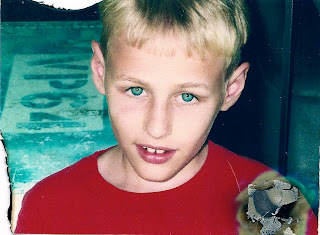 As for the letter, I stated in the last entry that it was from a childhood friend, Kyle Morrison. 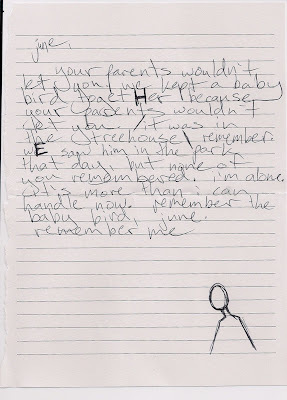 My memory of him is very vague, but the letter brought a few things back. We were a group of four kids, around ten years old, that used to play together after school. It would take some serious thought to remember the names of the other two children that Kyle and I played with. The letter mentions a baby bird that Kyle and I kept in a treehouse because my parents would never allow me any pets. No one else knew about it, which is what lead me to believe that the letter could be written by no one other than Kyle himself. 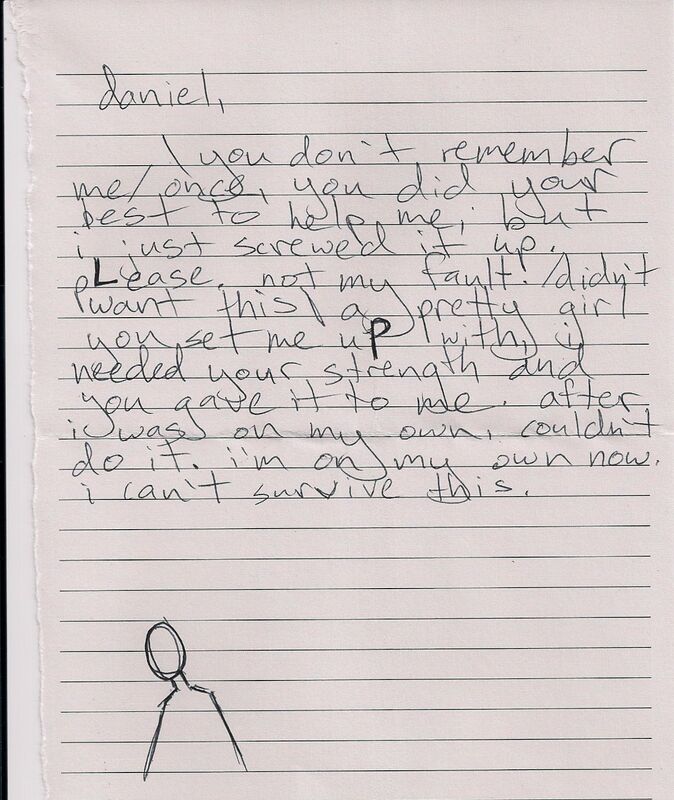 The rest of the letter is a mystery to me, especially the drawing at the bottom. I honestly cannot tell what the purpose of sending me this letter is, but both the letter and photo unsettle me to the point of needing to know why I have received them. As in my previous post, I ask that anyone who might be in contact with Kyle please help me to clear up this issue. I’m not the type of person that asks for help, but I honestly have nowhere else to turn. The police think it’s just a prank. My friends either think the same or that I shouldn’t get involved. I’m creating this blog to see if anyone out there has any answers. I received a letter in the mail a couple of weeks ago. I thought it was nonsense myself at first, but after looking over it again I realized that there might be something to it. It was from someone I knew as a child, I’m sure because only one person would know about the contents of that letter. His name is Kyle Morrison, and I want to find out why he sent me this. I scanned the letter so that anyone who’s reading this might be able to give me advice on what to do. I haven’t been able to find any of his contact information, so if anyone has seen or heard from him, please comment here. This photo was in the envelope with the letter. I’m assuming it’s Kyle as a child, even though my memory of his appearance isn’t very clear. I had forgotten about him completely until the letter arrived. The photo appears to be burned, which is unsettling. Again, if anyone can tell me where he is or why he might have sent this letter, please let me know. He should be around my age, 19 or 20. Thanks in advance.